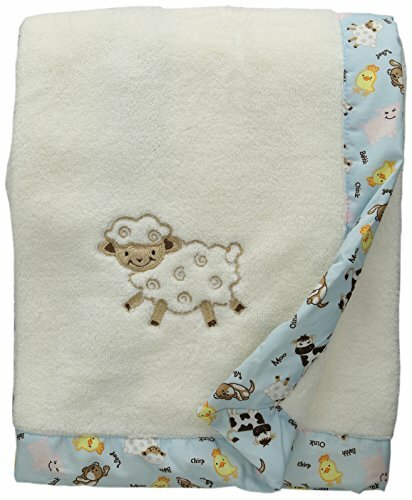 Keep your little one warm and secure with this Baby Barnyard Framed Receiving Blanket. Soft cream coral fleece is framed by a baby barnyard animal scatter print in butter yellow, burnt orange, caramel, chocolate brown, pearl pink, bubblegum pink, and white on a sky blue background. A sheep embroidered applique in the corner adds the finishing touch. Keep your little one wrapped in rustic charm with this sweet receiving blanket. 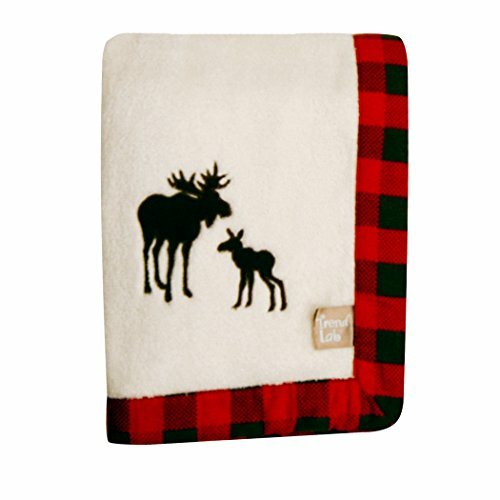 This machine-washable cotton blanket offers carefree maintenance and features a mother and baby moose embroidered applique for a whimsical touch. Theme: Basic Type: Receiving Gender: Neutral Material: Cotton Pattern: Solid Color Care Instruction: Machine Wash Organic Classification: Non-organic Color: Off-White 30 inches x 40 inchesWarning: Loose bedding can present a hazard. Please follow safe bedding practices as recommended by the Consumer Product Safety Commission. 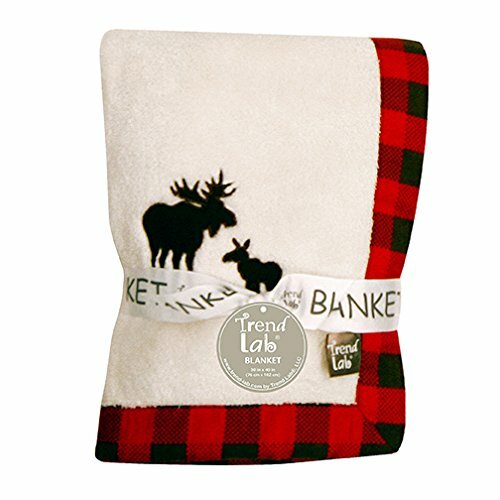 Keep your little one warm and secure with this Northwood's Framed Receiving Blanket by Trend Lab. Soft cream fleece is framed by a pinecone brown and deep red check print. A mother moose and calf embroidered applique in the corner adds the finishing touch! Blanket measures 30 in x 40 in. 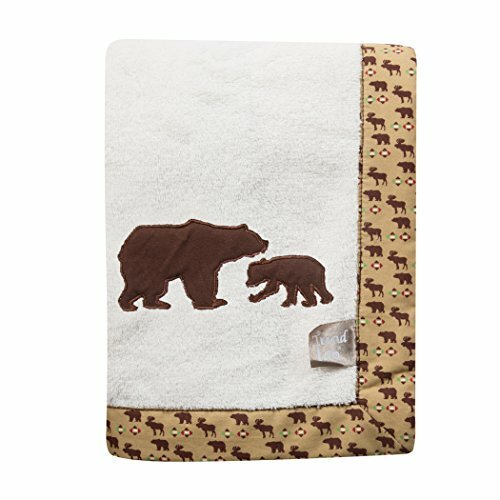 Keep your little one warm and secure with this Northwood's Framed Receiving Blanket by Trend Lab. Soft cream fleece is framed by an outdoors print in oak, flax, chocolate brown, deep red and clover green. A mother bear and cub embroidered applique in the corner adds the finishing touch! Blanket measures 30 in x 40 in. 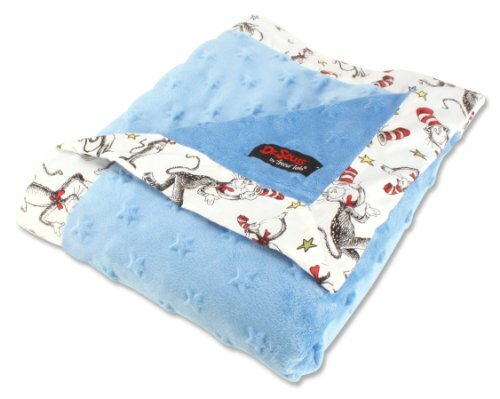 Keep your little one warm and secure with this Dr. Seuss Cat in the Hat Blue Framed Receiving Blanket by Trend Lab. Soft blue star embossed velour is framed by a cotton percale scatter print of the classic book's Cat in the Hat character in barn red and black with cornflower blue, mango, avocado and yellow accents on a white background. Blanket measures 30 in x 40 in. Product sold under license from Dr. Seuss Enterprises, L.P.
Keep your little one warm and secure with this Lily Stripe Coral Fleece Baby Blanket by Trend Lab. 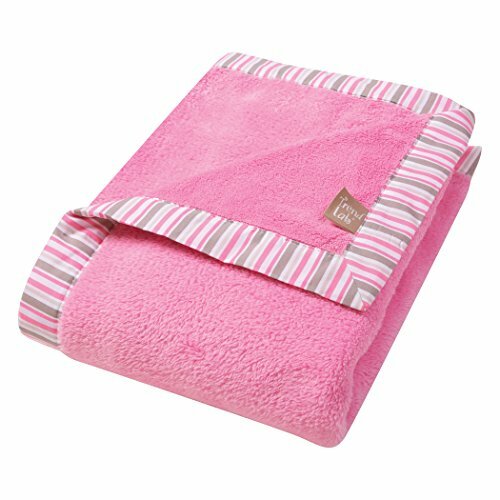 Soft pink fleece is framed by a pink, gray and white cotton stripe pattern. Blanket measures 30 in x 40 in. Baby blanket coordinates with Trend Lab's Lily collection. Please adhere to JPMA's Safe Infant Bedding Practices. 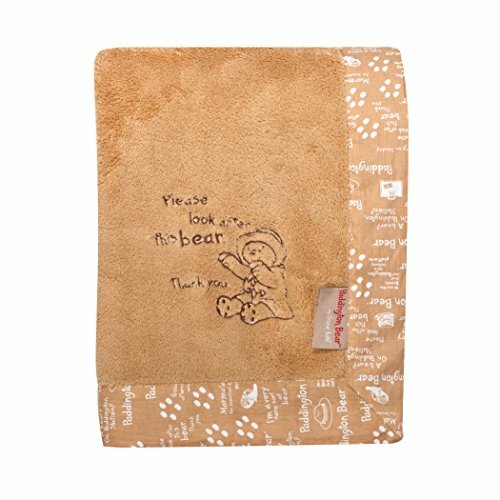 Keep your little one warm and secure with this Paddington bear by trend lab framed blanket. Tan velour is framed by a cotton percale, tan and white Paddington bear motif print featuring Paddington's favorite items and expressions and accented with a Paddington bear embroidery. Blanket measures 30 in x 40 in. Coordinates with the Paddington bear by trend lab collection. 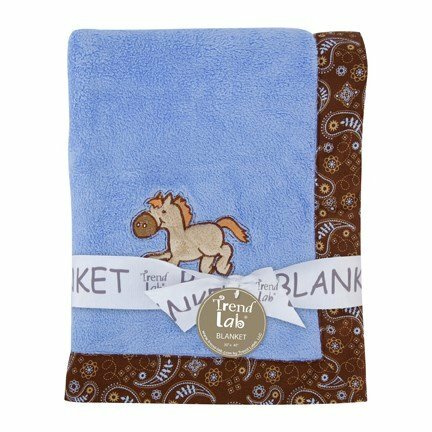 Keep your little one warm and secure with this Cowboy Baby Framed Receiving Blanket by Trend Lab. Soft blue coral fleece is framed by a cotton percale bandanna print in chocolate with powder blue and desert sand accents.Pattern: Cowboy, bandanna printColor: Blue/ chocolate/ desertMaterials: Cotton, polyesterCare instructions: Hand washDimensions: 30 inches x 40 inchesThe digital images we display have the most accurate color possible. However, due to differences in computer monitors, we cannot be responsible for variations in color between the actual product and your screen. 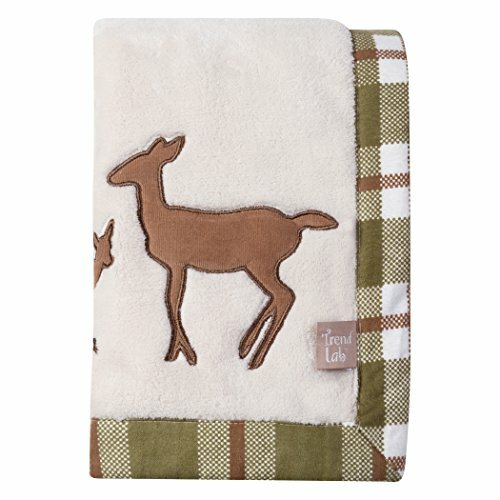 Keep your little one warm and secure with this Deer Lodge Framed Coral Fleece Baby Blanket by Trend Lab. Soft cream fleece is framed by a sage green, brown and cream plaid print. Cozy mama and baby deer appliques add the finishing touch! Blanket measures 30 in x 40 in. Baby Blanket coordinates with Trend Lab's Deer Lodge collection. Please adhere to JPMA's Safe Infant Bedding Practices. 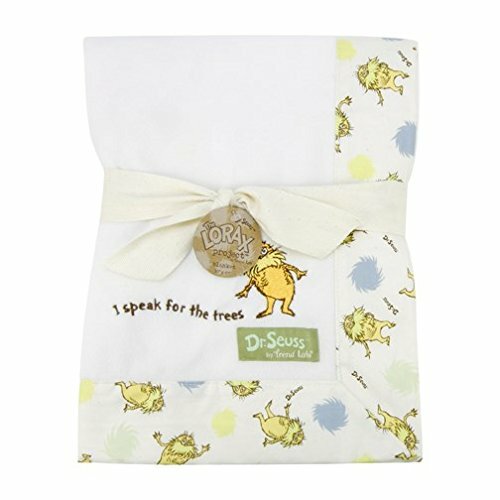 Keep your little one warm and secure with this Dr. Seuss The Lorax Framed Receiving Blanket by Trend Lab. Soft, recycled fleece is framed by an unbleached cotton Lorax and Truffula tuft scatter print in blue fog, sunshine yellow, honeydew, squash, and chocolate. An embroidered Lorax applique and "I speak for the trees" saying add the finishing touch. Blanket measures 30'' x 40''. Blanket coordinates with the Dr. Seuss The Lorax collection by Trend Lab. Copyright © Wholesalion.com 2019 - The Best Prices On Framed Baby Receiving Blanket Online.